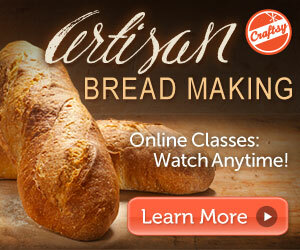 So, I had been neglecting my Craftsy Artisan Bread Making class (affiliate link). 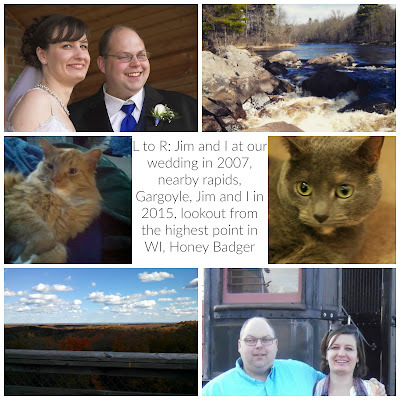 It was August, it was hot, I didn't have a day off to devote to making dough, the excuses went on and on. I got up today and it was overcast and looked like it would rain any minute. So no more excuses. Time to do lesson three- actual dough making. I spent most of my morning making the dough that is the basis of baguettes, batards, and boules. Peter Reinhart is a great teacher and I love that I can pause the lesson and replay any parts I'm having problems grasping. Mixing the dough was easy enough- bread flour, yeast, salt, and water. Then came the waiting game. When I've made bread in the past, it's always been like this: mix ingredients and knead dough, let rise, punch dough down, let rise, shape your dough (either into rolls, or a loaf, or whatever) and let rise again, bake, and eat. Peter's method is more time intensive but easier. Instead of kneading your dough down, you stretch and fold it, let it sit for 20 minutes, and then repeat this three more time! Then you let you lump of dough rise for an hour. Then shape your dough. I made two batards and a boule. Then let it rise at least another hour. Then you bake. But not at 350 degrees. At 500 degrees! With steam! After a few minutes you lower your temp and continue to bake until your bread has an internal temp of 200 degrees. What do you get after all this? The most delicious bread you have ever tasted! I've baked bread before, but nothing close to this good! It has a nice crispy crust, but is soft and fluffy on the inside. 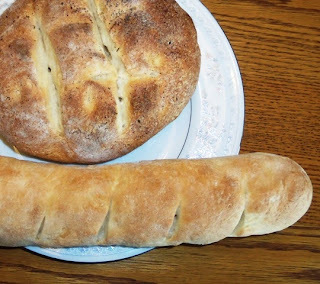 The third batard may or may not be missing because it was partially eaten. The stretch and fold method, allows your dough yeast to really ferment for a good long time. Turns out I've been shaping dough wrong all this time. Using the right method helps your loaf to hold it's shape and have a nice crust. Baking at a high temp with steam allows your bread sugars to caramelize enhancing the flavors and color. Using only bread flour improves the taste. In the past, if I didn't have bread flour, I'd just use all-purpose flour. So, I had to cook up so soup to go with the bread. 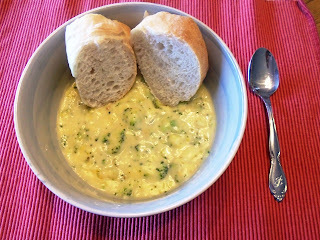 I had been salivating over this recipe for Broccoli and Cheddar Soup from "The Little Girl's Guide to Sugar and Spice". And it's delicious. Cheesy, and thick and yummy! Dipping my yummy crusting bread into the soup makes me sad that I have to get ready for work now and can't just sit home eating soup and bread and reading books. If you have any desire to make delicious. homemade bread, you have to check out this class. I can't believe how much better my breadmaking is after only three lessons. It makes me excited to see what else I'll learn.